Not here for long, but still made an impact, the lovely Jazz, click on the photo to meet her. 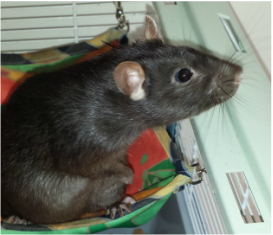 Three lovely boys, Tam bred here and Raga and Kazoo bred at Lovecraft. 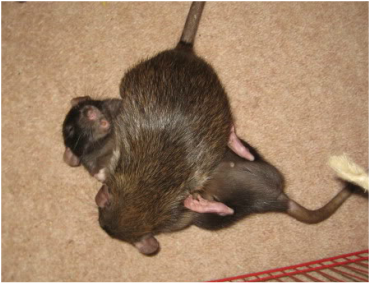 Both Tam and Kazoo fathered some lovely litters, one here and two at Lovecraft. They were a wonderful trio who kept me very busy. To read all about them and see some more photos please click on the photo above. 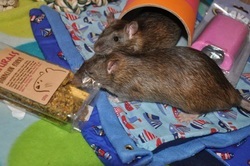 A lovely pair of boys from Lloyd at Eximius rats, Sam the energetic explorer and Bean the sensible dependable alpha. Find out more about them by clicking on the photo. Luke and Limi were a special pair of boys from Valience rattery. 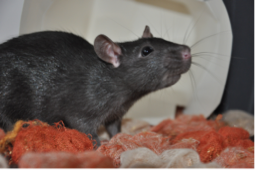 Luke was one of the nosiest and cleanest boys I've owned, winning the curiosity challenge more than any other rat I know. Limi was another wonderfully solid and reliable alpha, ruling the cage with wase. Click on there photo to find out more. These four boys were really special, Mu and Yoshi were the ultimate dynamic duo, hyperactive amusing and very affectionate. Loki and Odin were quieter but no less loving and attentive. Click on the photos to find out more about them. These boys were my first ever breeder lads. They were a revelation, we bonded so fast and there were such special characters in there. To find out more about them click on there photo.